Signs of All Kinds - Great Signs, Great Prices! for over 28 years. We provide the highest quality signage at very competative prices. Back-lit LED signs & halo letters produce eye catching effects inside or outdoors. All of our latest internally lit signs use LED technology for efficiency, less maintenance & longer life. using American materials and machinery! As our name implies, we offer signs of all kinds to businesses of all sizes. as well as Safety signs, Trade Show Displays & Banners. Carved wooden signs using HDU is our specialty. A unique business sign, custom designed and installed will impress your customers and make you proud. Available with genuine 23k gold leaf letters. We manufacture metal signs, including street name signs, parking signs, handicap signage, directional and public safety signs, name plates, commemorative signs and plaques, in alluminum, bronze, steel, and brass. We will provide you with graphics that help you get noticed! Sign design separates you from the competition. From car wraps featuring your company logo, to truck lettering and window decals, we do it better. Lighted signs and channel letters make eye catching neon signs for maximum impact on potential customers. Available with LED technology for cost savings and to minimize future servicing. Our specialized engraving equipment allows us to manufacture a wide variety of door signs and office signage that is attractive, serviceable, and ADA compliant with braille and raised letters. Accent your building or plaza with our custom outdoor signs and dimensional letters. We create channel letters and advertising signs to enhance your image and attract new customers. Vinyl graphics and Lettering make great metal signs, for permanent post / panel outdoor signs to promote your business. These signs are good looking, long lasting, and are affordabe. Custom vinyl banners can be used in a variety of ways for short term and inexpensive advertising signs, sporting events, golf tournaments, fundraisers, as well as trade show displays and signs of all kinds. We specialize in church signs and municipal services including library signs, police station signs and fire house signage, town office signs, as well as schools, recreation departments and hospital signs of all kinds. Make a bold statement for your campaign with our wide variety of political signs including lawn signs, banners, badges, stickers, rally fans and more! 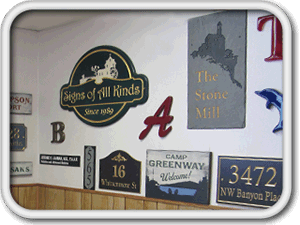 Custom hanging slate signs will direct clients to your office or home based business. Whether you are a doctor, lawyer, accountant, dentist, or offer professional services of any kind, these hand crafted signs look great for many years at a very reasonable price. These large commemorative slate plaques are deeply carved and represent a beautiful alternative to cast bronze at a substantial cost savings. These plaques will last for many years and are suitable for both interior and exterior use. We offer a variety of handcrafted metal scroll brackets for our hanging signs. Functional and beautifully crafted; they add the finishing touch of sophistication and polish to your sign. They'll definately add curb appeal to your home or office! We have something to fit every budget and application. Our signs are fabricated at our facility in Manchester, CT. We offer large scale fabrication, CNC routing, sandblasting, hand painting and gold leaf application, full color printing, vinyl lettering, dimensional carving and more! We provide full service installation with all of our signs. We've established a team of trusted professionals to aid us in all types of installations. Let us enhance your company's identity with graphics and signage. We offer a blend of subtle detail, art and graphics. Our signs draw the eye's attention to your business. Our custom signs can be tailored to a huge selection of outdoor signage in every shape, color & size. A wide variety of sign designs are available, including genuine, 23k gold leaf letters and graphics. Our state of the art factory & showroom space is located in Manchester, Connecticut and has been family owned and operated since 1989. We use only the finest materials and coatings available. We can design, build and install a beautiful sign to fit your budget. We offer competitive pricing. Custom decals, car window decals, vinyl banners, door signs & plaques will increase your company's image and appearance. We also offer ADA braille signs, lighted signs, traffic & safety signs of all kinds. We stock a wide variety of vinyl and sign materials for efficient service and quick turnaround Each sign is handmade to your custom specifications in our manufacturing facility. We provide design services and we can reproduce your logo on an eye catching and appealing professionally made product. We serve Hartford, Tolland and Windham counties in Connecticut. Satisfying the sign, signage and banner needs of Hartford, Manchester, Glastonbury, South Windsor, Vernon, Mansfield, Stafford, Enfield and Windham. Also, we serve Springfield, Mass. and the Western Massachuesetts area. We are conveniently located in Manchester, Connecticut.